Girlfriends. You can’t live with them, and you can’t live without them! Some girlfriends believe that they can do whatever they want and no one can stop them. From stealing your food to getting lipstick over your face, these girls are sure to push the limits! This girl obviously loves her boyfriend so much that she just couldn’t help herself from smothering him in kisses. 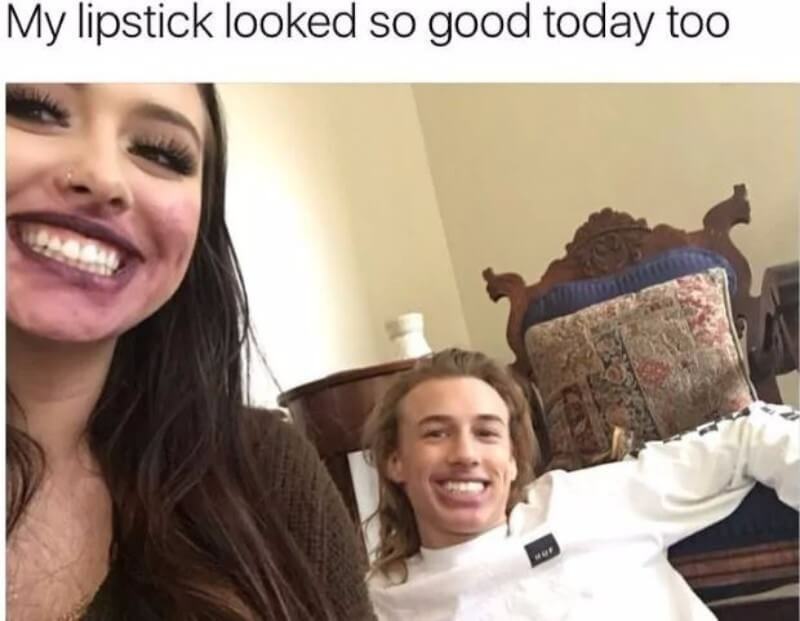 As she says, it’s too bad because her lipstick really looked great! Judging by her boyfriend’s expression, he certainly didn’t seem to mind. At least this girlfriend’s crazy antics are of the good variety! This girl does not buy into normal gender roles which say the girl is to be a damsel in distress; rather, she is the rescuer. 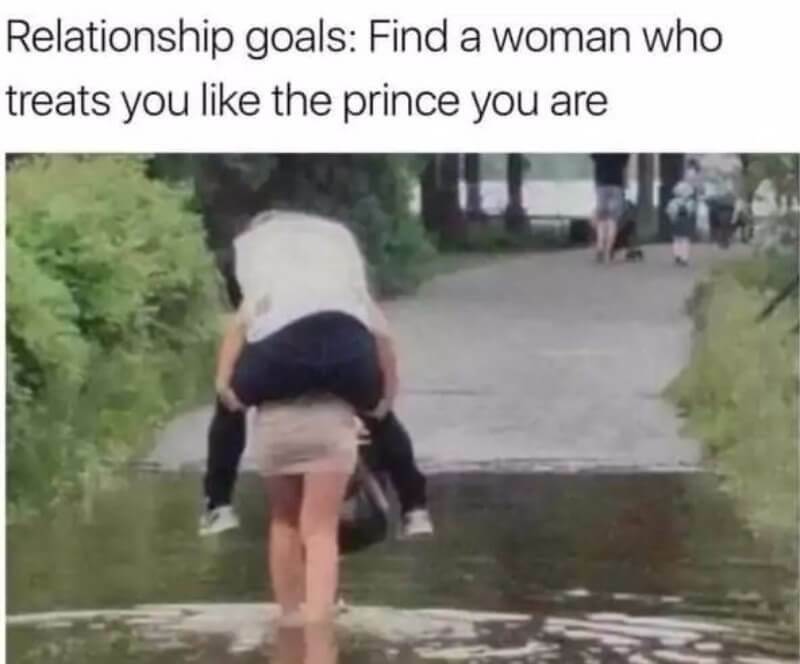 Clearly, she really didn’t mind as she is even in a mini skirt while she gives her boyfriend a lift over some standing water. Perhaps he had on new shoes he just couldn’t bear to ruin! As the old trope goes, some girls are apparently afraid to show their appetites. However, that is not the case for this girlfriend! She polished off an entire pizza by herself, except for the crust (which is questionable if you ask us). Although we definitely can’t blame her as it certainly looks delicious. Is this couple the King and Queen of Style of what? 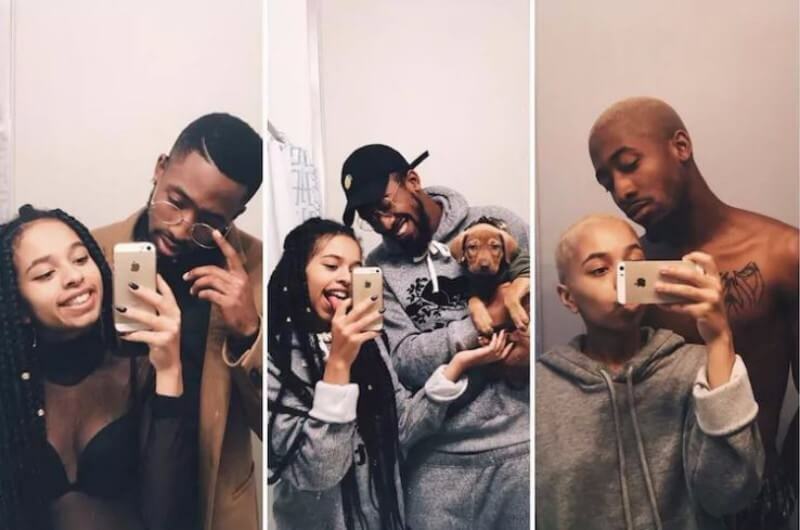 Previously, the girlfriend was rocking some Poetic Justice-style braids but then she decided to buzz her head and bleach it, and her boyfriend did the same. While the choice might be a radical one, we think she totally pulls it off! 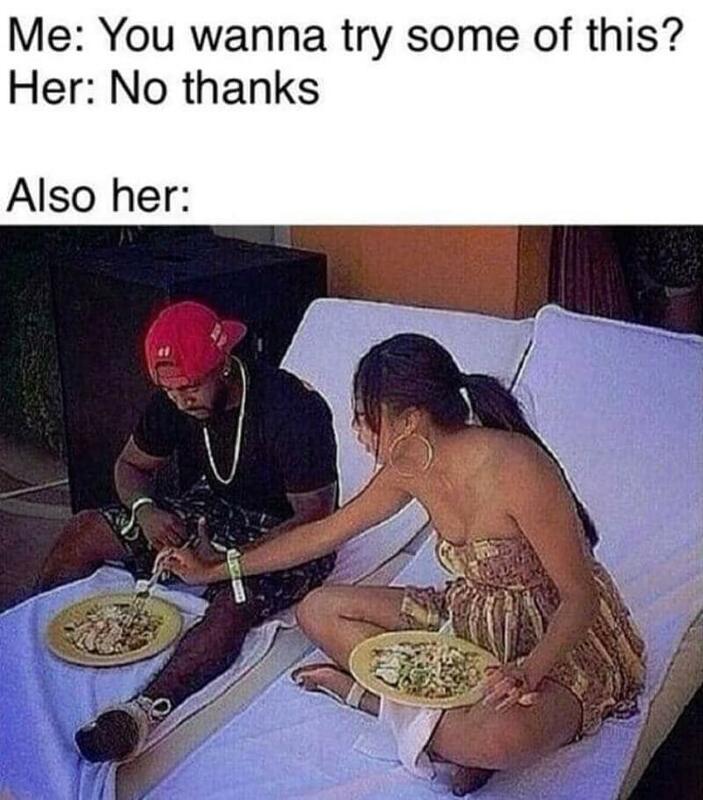 This meme plays off the joke that girlfriends will constantly steal your food. From not being able to decide what to order at restaurants or just wanting a bite, girls often can’t help but get their hands (and their mouths) on your food one way or another. When it comes to food, it might be best to always make a double order! 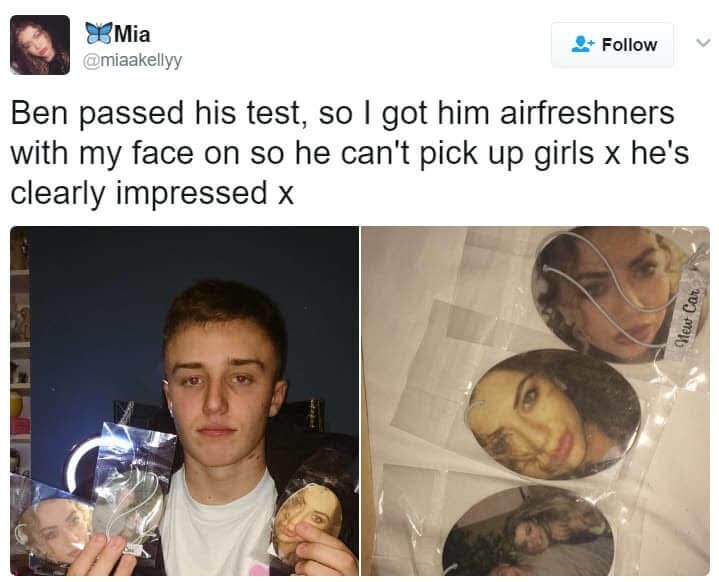 This girl had the perfect gift for her boyfriend: air fresheners with her face on it. Apparently, he passed an important exam and this was her gift for him. Obviously, he was thrilled with the purchase! This girlfriend definitely wants to remind her boyfriend (and whoever might ride in his vehicle) that she’s always along for the ride. In this day and age, people have gotten a little crazy with the scandalous sharing of intimate photos over social media or texting. However, this couple has something a little different in mind. 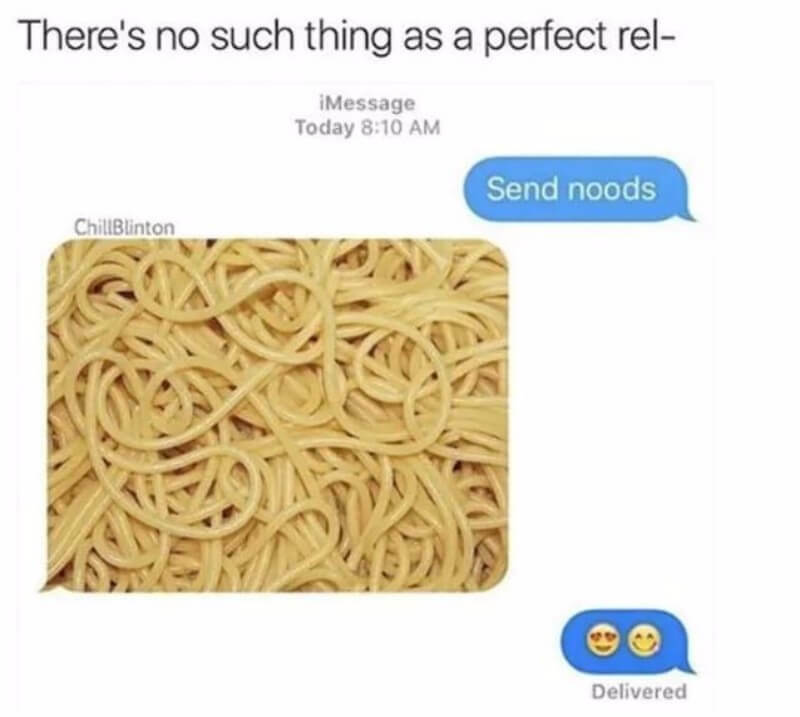 You know you’ve really met your match when “noods” delineates your shared love of all things pasta! This meme is pretty funny and it really speaks for itself. But we think this girlfriend might be more of a picky eater if she doesn’t enjoy fine dining. 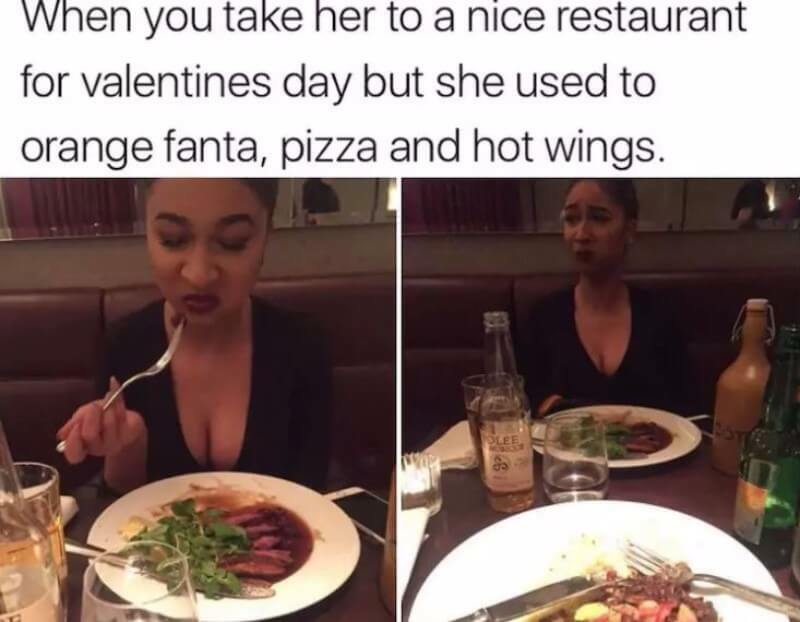 Then again, you can never go wrong with pizza and hot wings! Here’s to hoping she appreciated the nice restaurant her boyfriend took her to. 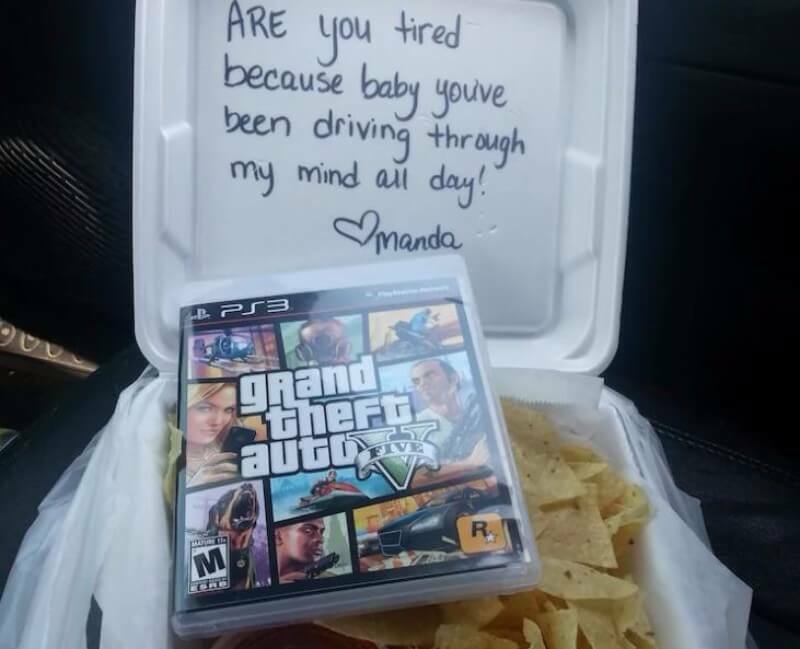 This girlfriend really knows how to drive home the romance. 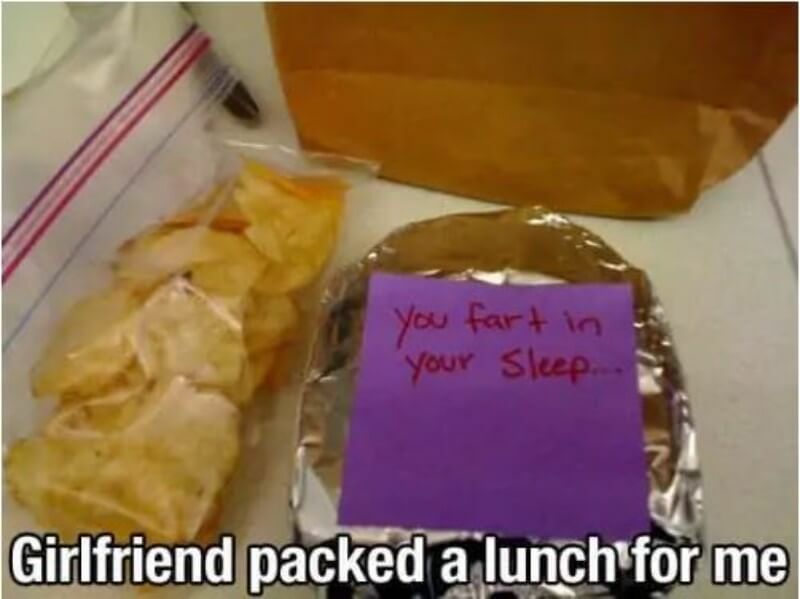 She left the note “you fart in your sleep”. Can you imagine opening your lunch only to find this note being left for you? Although, once you love everything about your partner (the good, bad, and the smelly) you know the love is definitely for real! Sometimes it comes down to using memes to get your point across. 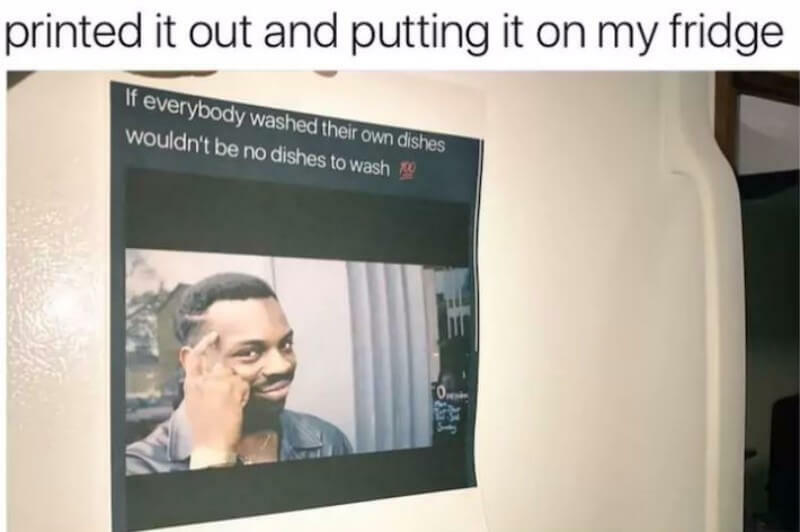 After asking her boyfriend to help clean up in the kitchen one too many times, she posted a meme on the fridge to speak for her. Although it definitely makes sense, if everyone cleans up after themselves there will be nothing to clean up! 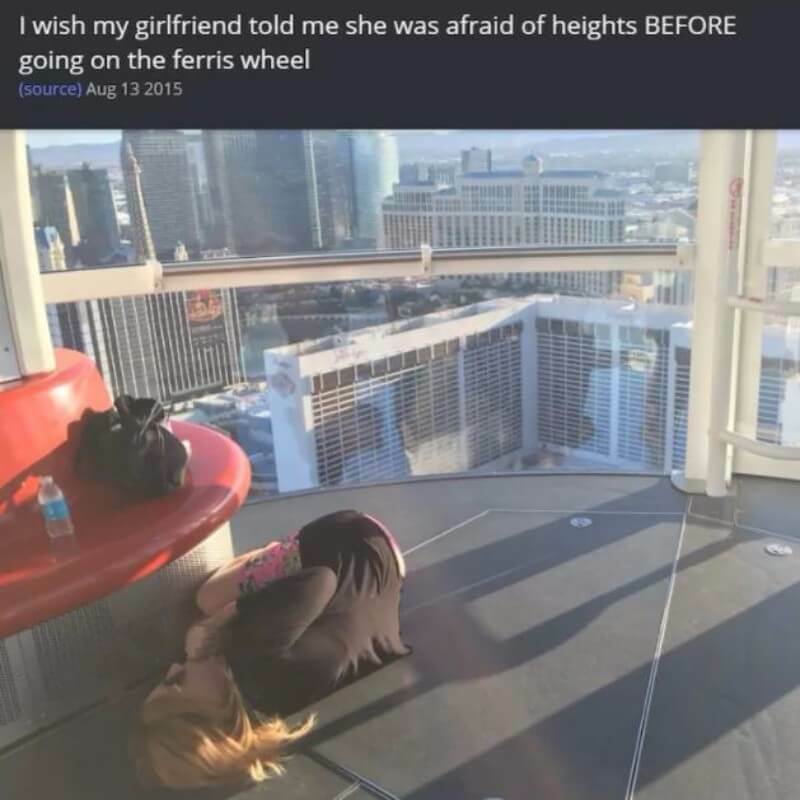 As the image is captioned, this boyfriend wished his girlfriend had made him aware of her crippling fear of heights before they decided to get on a super tall Ferris wheel. Instead she decided to curl up in the fetal position with her sunglasses on. It does look pretty high in the sky so we will let her slide on this one! Another girlfriend cliché is that they will force you to watch all kinds of annoying romance films. However, every now and then you meet one that is truly contrary to the norm. 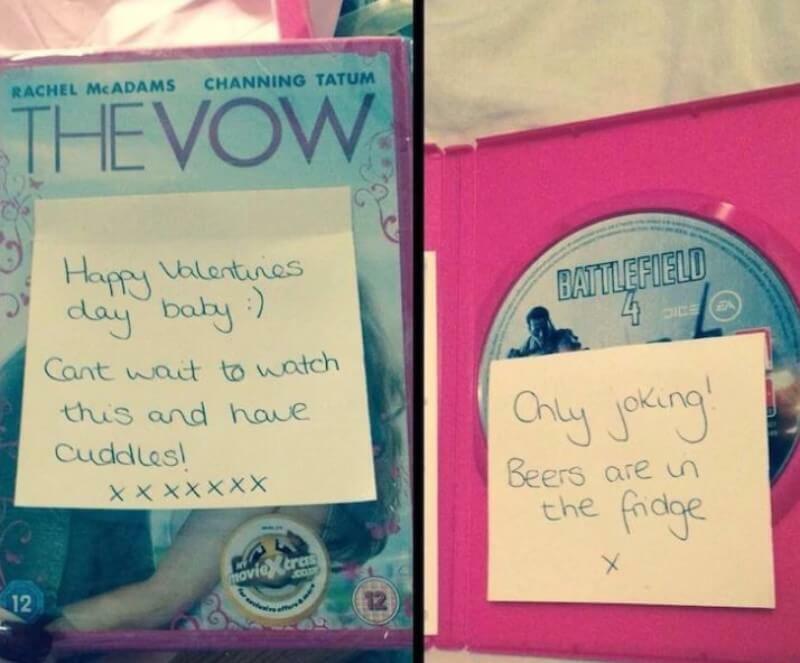 While at first the boyfriend thought he was in store for some super boring Valentine’s day viewing, he opened the DVD only to find a video game and a note about beer. Sounds like a win to us! 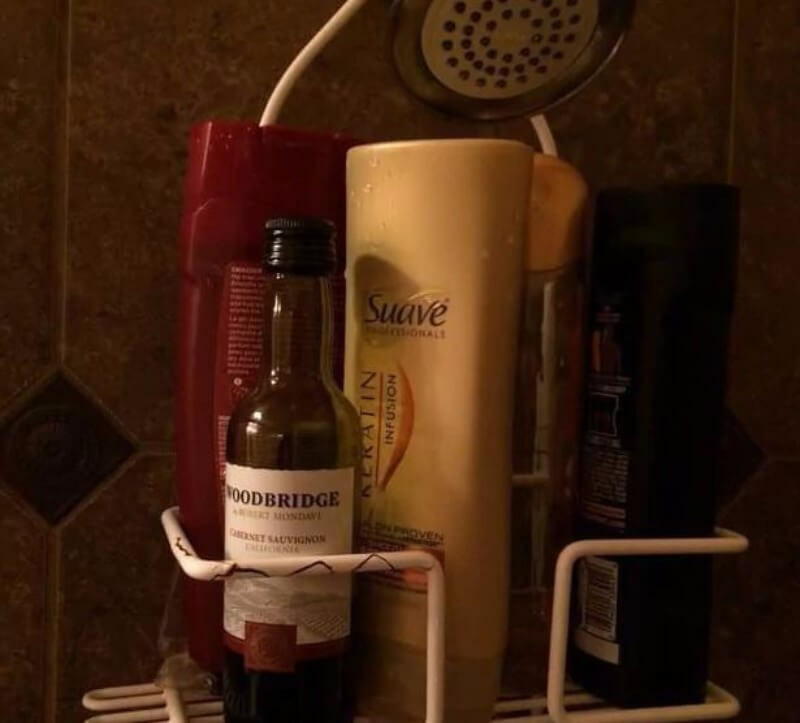 When taking an innocent shower, this boyfriend stumbled upon his girlfriend’s “shower wine”. While everyone can live life the way they want, we think if you can’t wait until you get out of the shower to drink wine, you might want to re-think that one in the first place! This girlfriend had to take desperate measures to protect her private chocolate stash. Every woman knows that no man will ever be willing to go near their female products so this is definitely one of the best places to hide your candy. This little trick would also work if you have children! 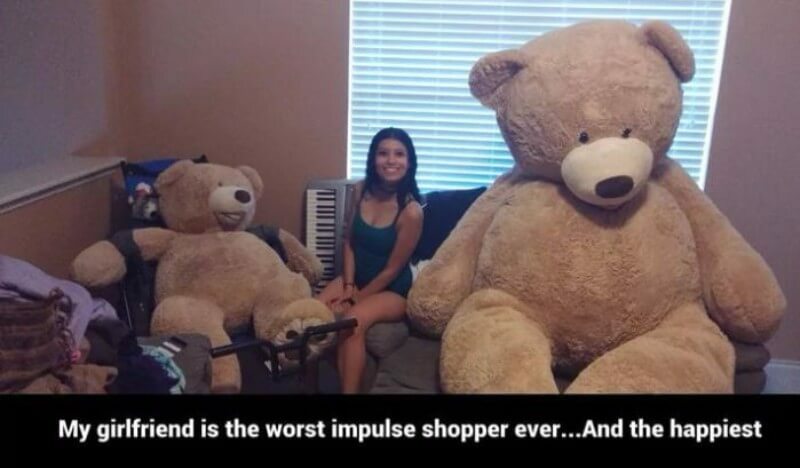 As the image is captioned, this girlfriend is the “worst impulse buyer ever…and the happiest”. While some boyfriends would get annoyed with their girlfriend’s shopping habits, this boyfriend seems to be pretty accepting of it. Hey, if a giant teddy bear makes you really happy, then by all means, go for it! Popular Instagram makeup artist Nikita Dragon posted this image on Instagram and tagged her boyfriend saying “haha sweetie you wish keep scrolling”. We can definitely tell that she is maybe a little bit of an overprotective girlfriend, to say the least! 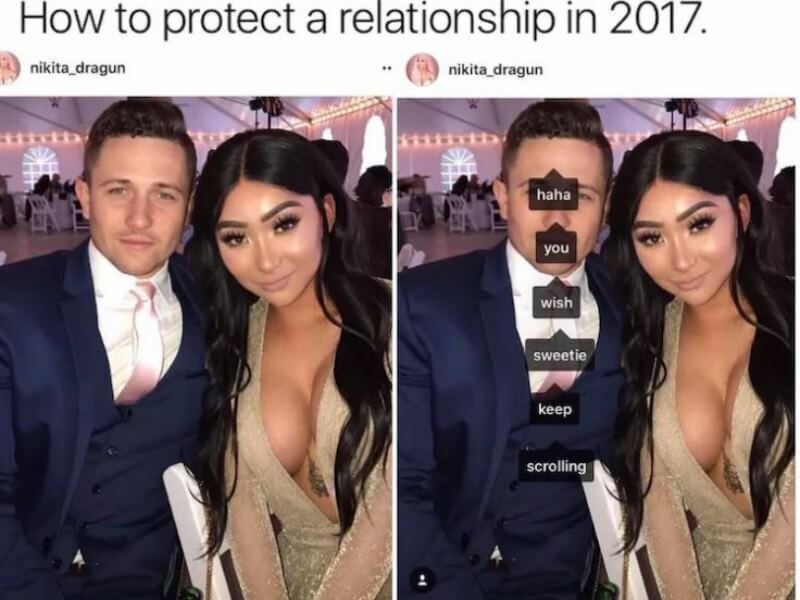 Although this is probably not the best way to “protect” a relationship, do whatever works for you! This girlfriend is another who is a little bit “extra”. 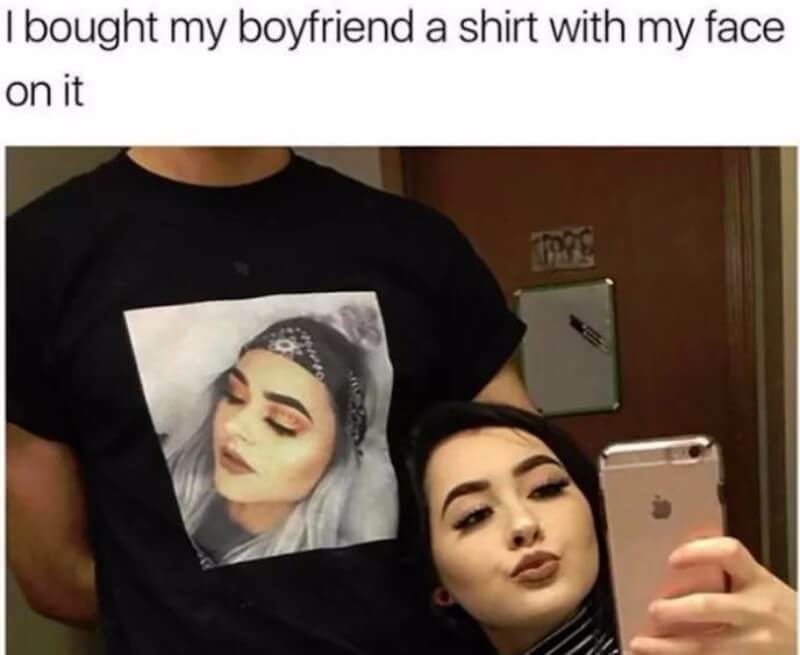 She decided to buy her boyfriend a shirt with her face on it, just to let the world know who he is dating. We think this is actually pretty funny — if he’s actually willing to wear it, anyway! An argument as old as time (or as long as indoor plumbing has existed) is the argument over leaving the toilet seat down. Men tend to leave it up forgetting to put the seat back down. This is particularly annoying during the night, when a girlfriend is likely to fall in if the seat is left up. 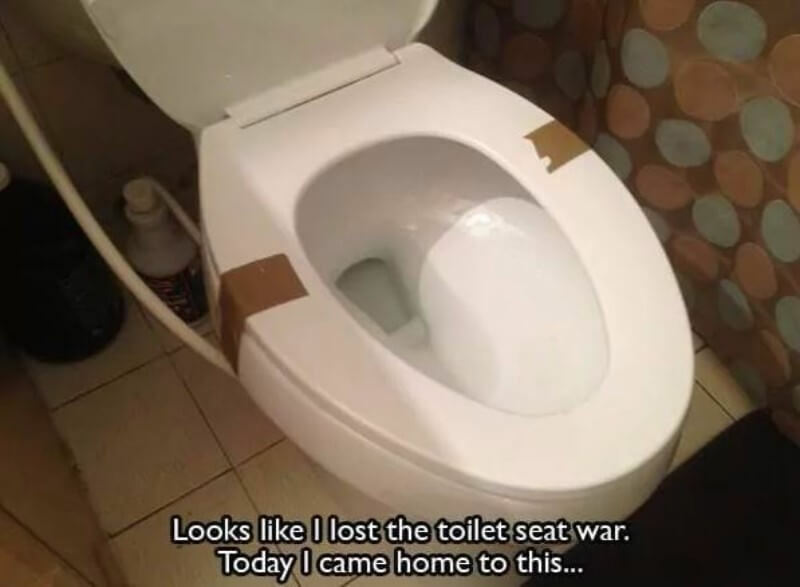 Needless to say, this girlfriend had one creative way to win the battle. This girlfriend might not be getting back at a current boyfriend but she is definitely poking fun at her exes. 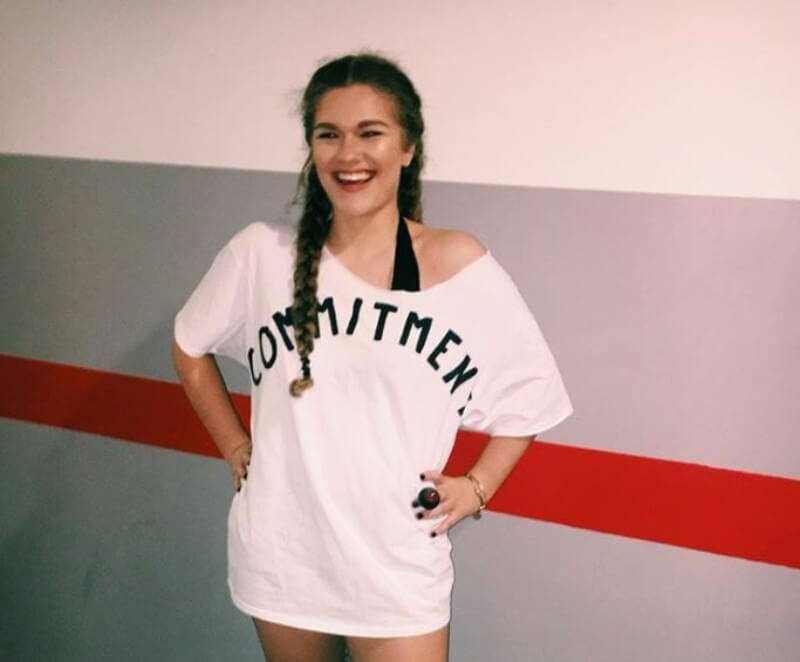 She decided to dress up for Halloween wearing the scariest costume she could think of: Commitment. We think that this hilarious costume might ring true for a lot of boyfriends out there! This girlfriend was completely ecstatic that she was the one to catch the bouquet at her friend’s wedding. But when she sent a Snapchat of the moment to her boyfriend, he was not quite as happy. 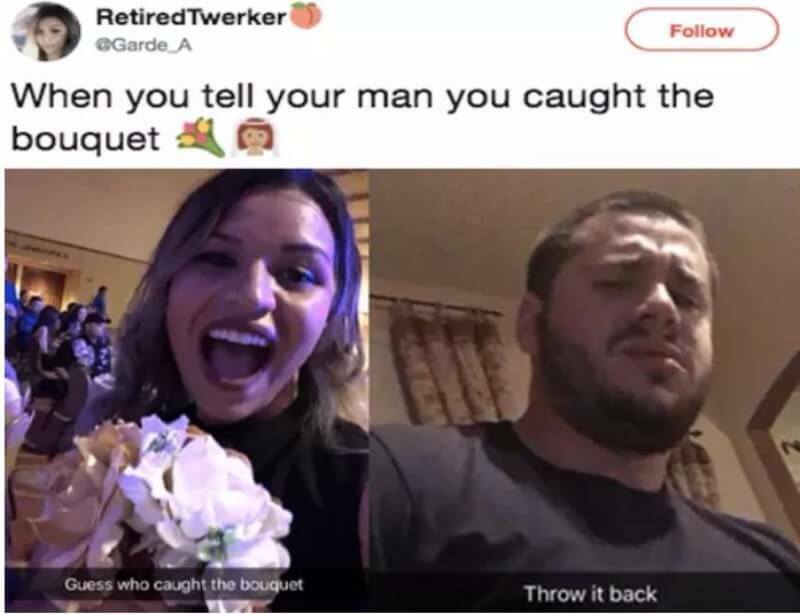 His expression is totally hilarious as he demands that she “throw it back”.